Go north from Jackson into GTNP and continue past the Moose turnoff. On the left will be a road marked Schwabacher's Landing. Drive to the parking lot and hike north, past the beaver pond where everyone takes the iconic shot, and in about 300 yards, you will find this upper beaver pond. 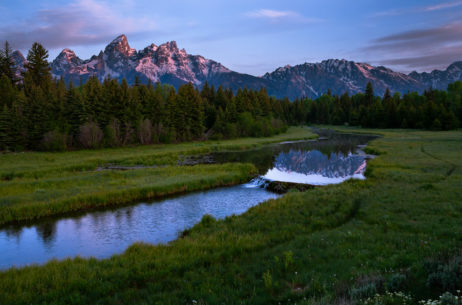 Taken at first light in June, 2006 at Schwabacher's Landing in Grand Teton National Park.